Do you ever get ideas about something or feel like you have a nudge in a certain direction, but you ignore them? If you continue to do so, those feelings will get less and less. Intuition is sort of like a muscle. You have to keep using it, honing it…the more you practice it and listen to it, the clearer your intuition will become. 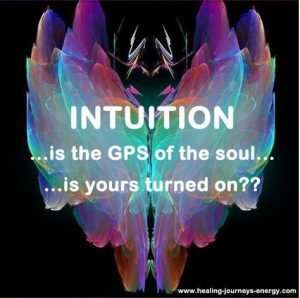 How do you know you are having an intuitive moment? Well first you have a thought, and then something happens, and then you say…I knew that…or…I should have listened to myself. It really does happen all the time to most people, but if you don’t pay attention, you lose that moment and that connection. Your intuition can come in many ways. It can be a knowing about something, or maybe you might just say something without thinking that seems right, you might hear a voice…don’t worry about that one, you’re fine; LOL, or if you close your eyes you may picture something. The next question is probably, how can you get it stronger? First still your voice, not only the one you speak with, but the one in your head. The quieter those voices are, the more likely you’ll feel the connection to your intuition. Meditation works well for this and it doesn’t have to be sitting quietly for a long time. If that works for you, great, but I tend to fall asleep. You may find that gardening, being near the water, dancing or walking in nature does it for you. Whenever your mind gets quieter, you are on the right track. The more you listen and act on your intuition when you feel or know something, the more that knowingness opens up and your connection deepens. You may ask, connection to what? That definition really depends on what you believe in. I believe the connection you feel will be to your highest self at source. You may simply see that as God. If you get really connected, you may feel you go from intuitive to psychic. That word has a lot of negative connotations nowadays. But one of the definitions is relating to the soul or mind and one of the synonyms is spiritual. Just because being intuitive is inexplicable, doesn’t mean it’s strange or odd. Being different can be good, and being connected in a deeper way to your source is the best of all.